Administrative/Biographical HistoryPeter N. Moogk was born in 1943 in West Chiltington, England, to Canadian parents. The family immigrated to Canada in 1946, arriving on the Norwegian ship Stavangerfjord. Moogk’s father was a Military and Air Attache; his family was stationed at the Canadian Embassy in The Hague from 1954–1957. Moogk’s mother has some Dutch ancestry in her family history. When Moogk was attending school in the Netherlands, he heard first-hand accounts of the German occupation and, in 1957, attended a Dutch Quaker School at Kasteel Eerde. The school was established in 1934 to provide German Jewish students with an education free of Nazi discrimination. After the German invasion of May 1940, fourteen students from the school were unable to avoid capture and died after deportation. When Moogk was a student at the school, classes were taught primarily in Dutch, with some in English; there were a few Jewish teachers as well as students. Moogk was married in 1965 to Susan Rosa Tovell, and has three children: Jonathan, Benjamin and Anna. He received a B.A. Hons from the University of Toronto (Trinity) in 1965, and an M.A. in History from the University of Toronto in 1966. He was a student in the French Canada Studies Program at McGill University from 1966-1967, and received a PhD from the University of Toronto in 1973. Moogk is Professor Emeritus (History) at the University of British Columbia; his research interests include the social and cultural history of early French Canada, including Acadia; twentieth-century Canadian military history; and the Second World War. Moogk is the author of four books, most recently, La Nouvelle France: The Making of French Canada (East Lansing: Michigan State University Press, 2000), winner of the Heggoy Prize in French Colonial History. 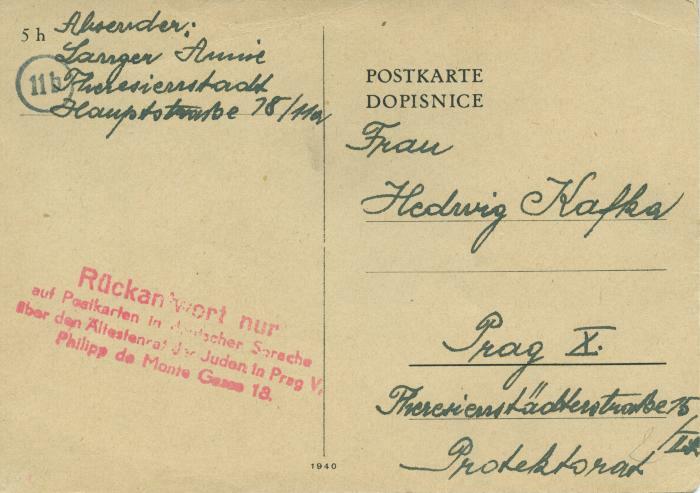 Scope & ContentItem is a postcard from Annie Langer at Theresienstadt to Hedwig Kafka in Prague with a stamped reminder that all such cards must be written in German and that reply cards should be given to the Jewish Elder of Prague. Dated 19 Aug 194-.